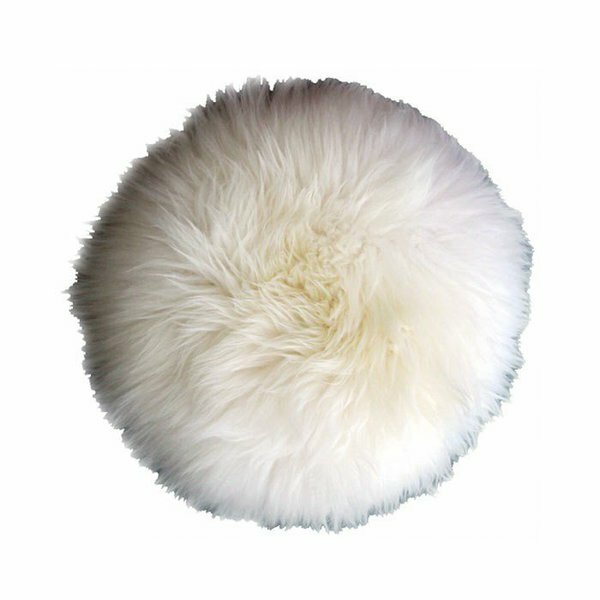 you like natural raw materials especially the incredible softness, comfort and magnificent appearance of sheep skin. 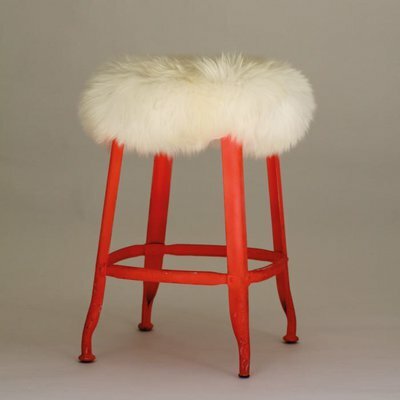 you are a fan of stools, do not hesitate to get your guests to sit on them for dinner, but admit that a fluffy cover under their bottoms is likely to bring significant comfort to their buttocks. 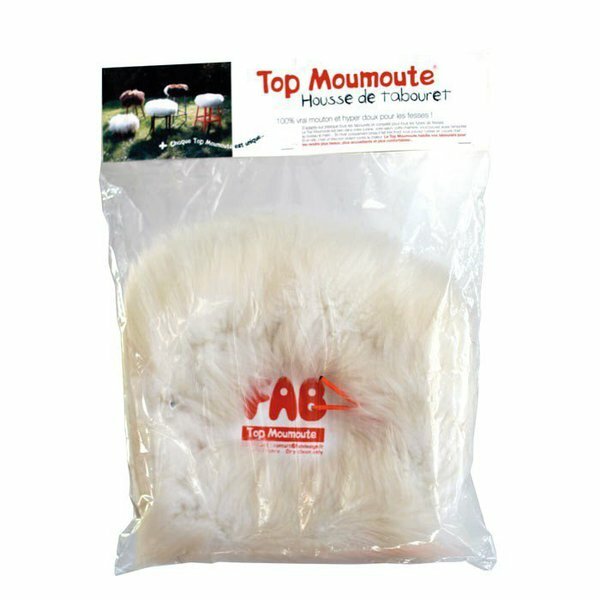 you appreciate cosy, mountain, countryside, fun, Middle-Age knights or Attila and the Huns atmospheres... whatever, the Top Moumoute sheepskin cover will wonderfully satisfy all your fantasies. Top Moumoute is a stool cover or a type of cushion which is luxurious and ultra comfortable for butts and cosy for your interior. 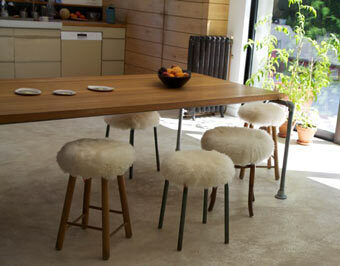 Its organic look suits old stools that have become a little quaint as well as modern stools. Before placing it on a stool, remove the packaging of the Top Moumoute, shake it, stroke it with your hand to give volume to the wool. During this operation, some hairs may remain in your hands. Do not worry, this is normal: sheep and consequently Top Moumoute are not subject to baldness, but go through subtle haircut to look even nicer. It is the residue of this haircut you might have between your fingers. 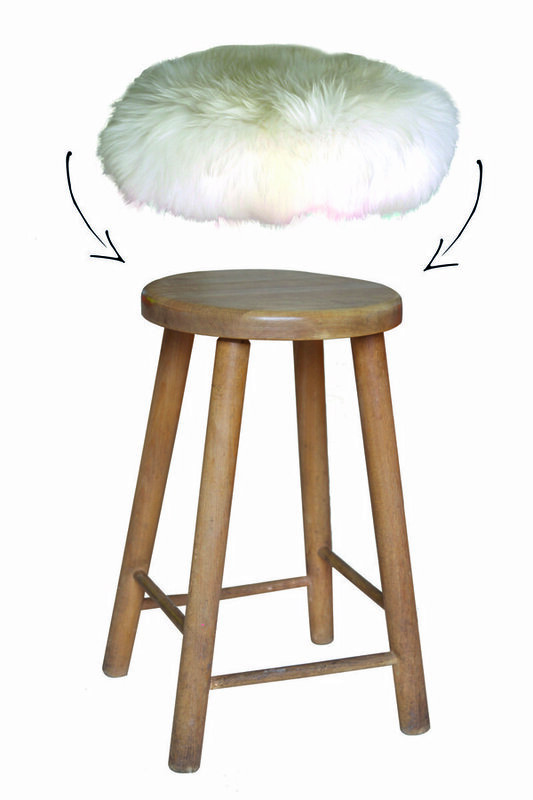 The fitting is dead easy: all you need to do is centre Top Moumoute on the seat of the stool, which can be round, square, oval, and then position the elastic. For small seats, you may need to tighten the elastic situated inside the cover, having of course undone the knot without forgetting to do it up again to fix Top Moumoute. 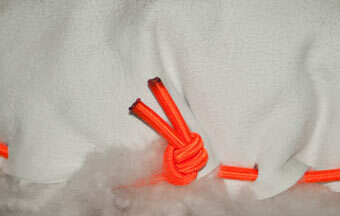 Irregularity: Top Moumoute covers are carefully handmade in beautiful natural skin and are not industrially calibrated. Sheep are living beings and consequently each sheep is unique: some have stiff hair, others have curly hair. 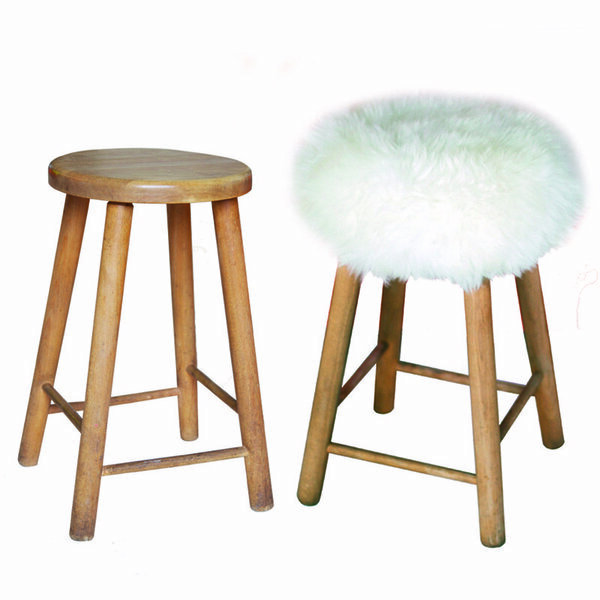 Each stool cover is therefore unique, and this is precisely what makes them cosy and charming. However, all skins have in common extreme softness, and the capacity to keep your bottom warm in winter, and insulate it against heat in the summer. 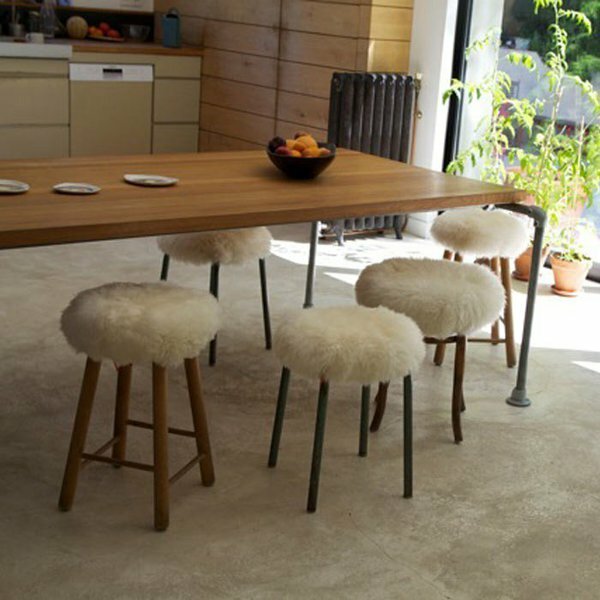 Sheepskin seats cen be machine washed, cold wash wool cycle and without washing powder or very little (special wool washing powder). Shake thoroughly when you take it out of the machine and dry on a flat surface. Then brush vigorously with your hands or with a hairbrush. The softness, the quality, the resistance of Top Moumoute are the result of a particularly eco-friendly treatment of the skin. All the agents used during tanning and for the finishing touches meet the directives of the European Union in terms of preservation and protection of the environment (DIN EN ISO 9001/2000 standard). The skins, their manufacturing and their treatment present no danger for adults and children. They are natural and biodegradable. 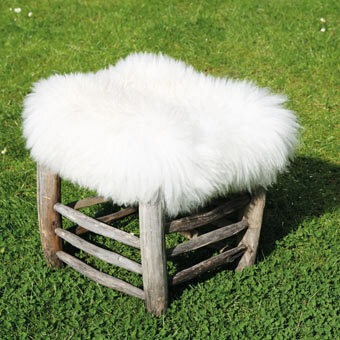 comfortable - so soft you will no be able to resist sitting on it; insulating in summer, cosy in winter, you will also want to put it on your head all year round. 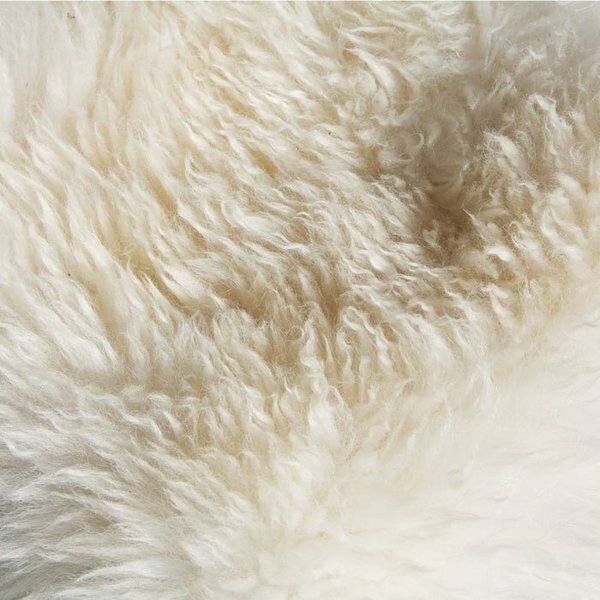 natural: what makes the difference between Top Moumoute and other comparable products on sale is the exceptional quality of the selected skins and the hand made finishing touches, guarantee of an organic chic far away from all synthetic cushions and other covers. perennial: Top Moumoute may seem expensive, but since it is top quality, you will enjoy it for a very long time.